The folk metal act Eluveitie started out as a studio project in 2002, yet this Swiss group of guys and gals quickly became much more. The band’s innovative style of combining their country’s traditional instruments with death metal made them unique and successful. Becoming one of the biggest metal acts in Switzerland took its toll and a lot line-up changes have happened over time. The biggest split occurred last year when they lost several key members simultaneously. Anna Murphy, Merlin Sutter, and Ivo Henzi left the band last spring, but they made it abundantly clear that they were not done making music. 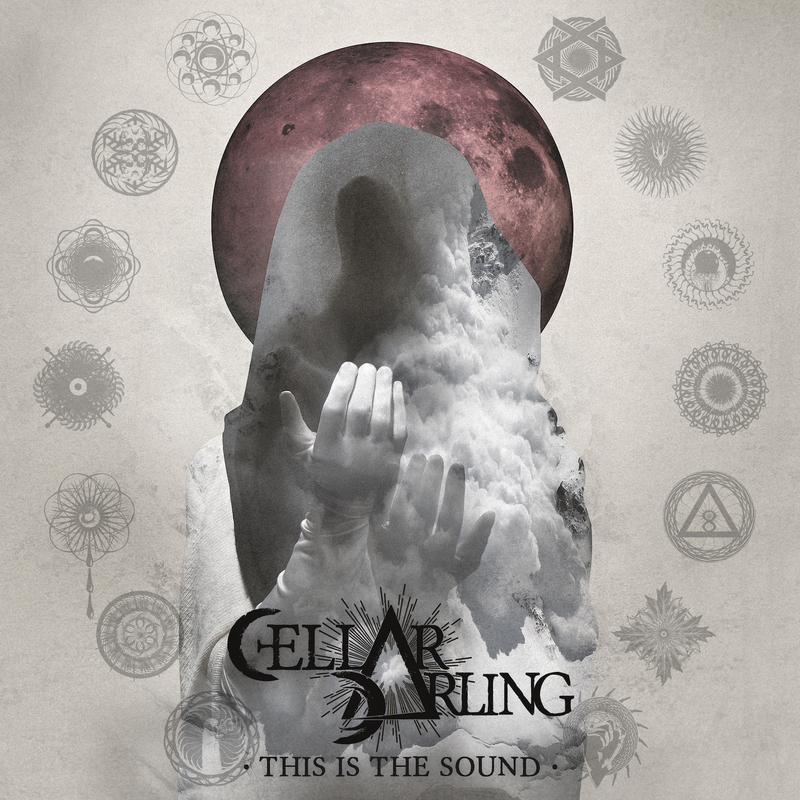 In September of 2016, the three self-released the first single from their new band, Cellar Darling. The song, ‘Challenge’ was received with open arms and became an instant hit. Now signed with Nuclear Blast Records, the band is ready to release their debut album, ’This Is The Sound’, on June 30th. ‘Avalanche’ opens the album with an atmospheric hurdy-gurdy paired with Anna’s genial yet fervid voice that instantly fills you with comfort. You feel the warmth of emotion as Anna, sounding similar to the legendary Anneke van Giersbergen, glows with a slight, earnest quiver in her voice. The song rips into emotions of angst and elegance that make a twisted yet truthful presentation of the sound. Tracks like ‘Black Moon’, ‘Under The Oak Tree’, and ‘Starcrusher’ have Anna’s vocals slightly more out front than the rest of the instruments. Her enticing storytelling about love and loss has you listening intently while enjoying Ivo’s distinct guitar tone that makes each number sound deliciously full. With layers and movement, the guitars ground the atmospheric momentum of the songs. They are constantly stirring the listener’s sensitivities with the contrast of sweet vocals, the hurdy-gurdy, and Ivo’s strong, substantial playing. Merlin’s drumming, giving some proggy vibes, along with Ivo’s bass skills capture a unique heaviness that fits perfectly with the overall tenderness of the band. The third track, ’Challenge’, is the first single they released last year. The epic sounding, transparent piece soars to new heights of sentiment and wit, given with such conviction that you know these three aren’t messing around. Carefree inspiration fills this song, along with passion and heart making it cut, and cut deep. On ’Hullaballoo’ and ‘The Hermit’, Anna continues to lull and caress with her drudge-like vocals that are seeping with emotion. Sweet and seductive, they’re telling stories like secrets, some being sad, and some silly. A number of songs on this 14-track album leave you haunted by the articulation of different stories being told. Anna’s effortless vocals continue to make the heart melt, leaving you in a constant state of vulnerability and happiness. The guitar work never ceases to offer those fat, juicy riffs and Merlin’s drumming aids to the overall sound with his finesse. Songs ‘Rebels’ and ‘Hedonia’ let the band’s folk roots shine by greeting you with the somber yet pleasant sound of the hurdy-gurdy, which is the most outstanding part about the album. Listeners of Eluveitie will be used to the stringed, hand crank-turned instrument, but those who aren’t, will find its fantastical feel remarkably refreshing. The heaviness with the whimsical vibe, is captivating and profound. Even down to the last track the band continues to surprise and impress. The fluidity and sophistication on ‘Redemption’ gets under your skin. Anna’s weighty words paints pictures and stir souls as she gives her 100 per cent. It’s not happy music, it’s truthful, telling relevant narratives, and honestly revealing the different colors of the heart. Cellar Darling is a unique group of very talented musicians who love to tell stories. Their unorthodox approach in making music is revitalizing, original, and well worth purchasing.